Hello, Hola, I am Diana Davidson founder and teaching director of Songbirds Music. 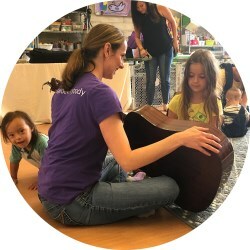 Since 2008, Songbirds Music has provided music and movement classes in San Diego. Music Together® and Canta y Baila Conmigo® are the two main programs offered along with preschool programs, library classes, special events, workshops, birthday parties and more. As a teacher, caregiver, and parent I know how important it is to spend quality time with our children. Songbirds Music is proud to provide a place where families and friends with little ones (ages birth to 5) can sing, dance, learn and play together in a fun and fulfilling way. So, what is the difference between all the programs? Our goal is to nurture each child's natural enthusiasm for music and movement. We sing, dance, play rhythm games and instruments, and have fun in an non-formal setting that enriches children's musical environment and guides them toward a lifetime of musical enjoyment. We recognize that all children are musical and that every child needs a stimulating, supportive musical environment. Come share many delightful musical moments with your child. * A community of families sharing songs, instrument play, rhythm chants and movement activities in a relaxed, playful, non-performance-oriented setting. * Music learned through developmentally appropriate activities that support and respect the unique learning styles of very young children. * Infants, toddlers and pre-schoolers participating at their own levels and learning from one another in family-style classes of mixed ages. * Watching your child/children achieve basic music competence, independence, confidence, and coordination. * Parents and caregivers contributing to the enrichment of their child’s music environment-regardless of their own musical abilities. * Meeting new friends and family in your neighborhood. * Learning new songs every semester featuring great arrangements of original and traditional songs in a variety of tonalities, meters, languages, and cultural styles.